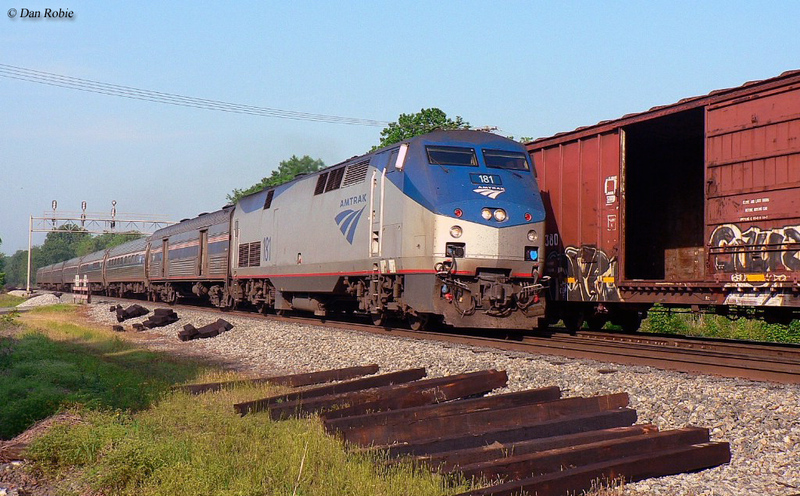 Today, Amtrak's Carolinian operates as a through train from Charlotte, North Carolina to New York City although this was not always the case. 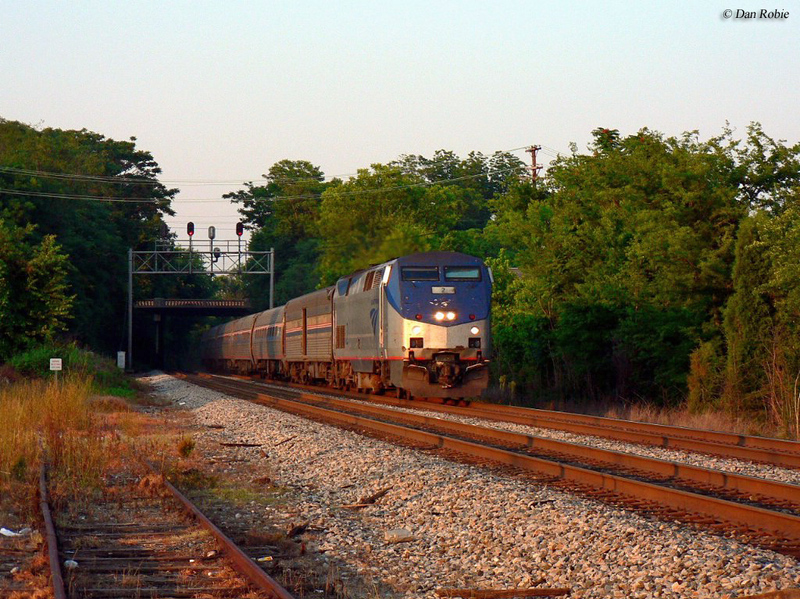 It began as partially subsidized service from North Carolina with management of the train handed to Amtrak and initially only served the state of Virginia. However, setbacks and lack of projected revenue caused the train to be cancelled at first after just a year in service. It returned some years later with better funding and marketing. Since that time the train has enjoyed relatively good success and generally sees increased demand from the public on an annual basis. The train's popularity allowed the state to inaugurate a new, regional train known as the Piedmont, which has shown even stronger demand. North Carolina one day hopes to provide high speed rail service across the state from Asheville to Wilmington as well as other points such as Richmond and Atlanta. Today's Carolinian operates over a route that was once traversed by the Southern Railway's famed Crescent (New York-Washington-Atlanta-Montgomery-New Orleans), Pelican (New York-New Orleans), Southerner (Washington-New Orleans), and several other named trains due to the fact that is primary north-south main line passed directly through Charlotte. Since the railroad did not initially hand over its then flagship train to Amtrak in 1971 known as the Southern Crescent, service on the line continued until February, 1979. Before this time, however, most passenger rail service within the Tarheel State had long since ended years earlier. In the early 1980s, however, the state began planning with Amtrak to return some level of service with partial subsidization. This new train would be known as the Carolinian and was originally inaugurated on October 28, 1984. For North Carolina's part it funded the train with about a $500,000 subsidy with the initial idea to operate the train only between Charlotte, Greensboro, Raleigh, and Richmond (Virginia). 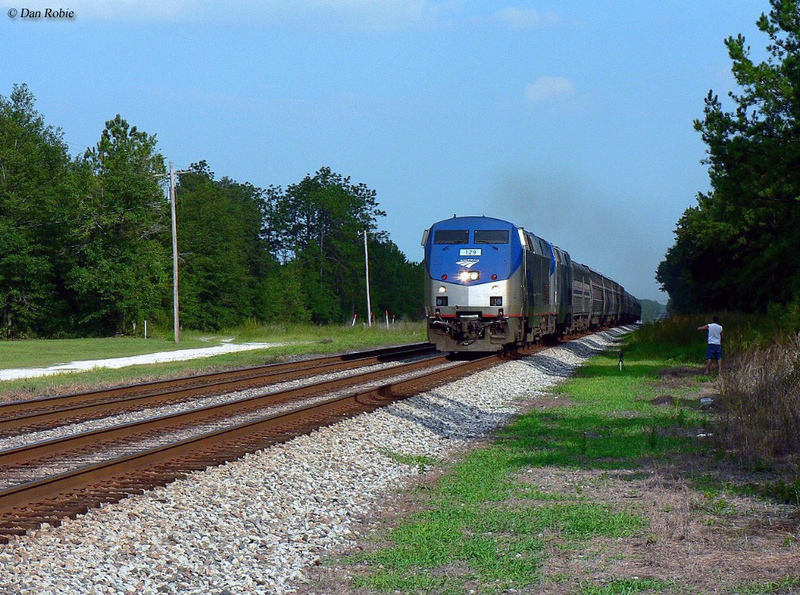 However, connecting service to Washington, D.C., New York and all major points in between would be handled by the Palmetto. However, for whatever reason the train did not meet projected revenues despite the fact that it held relatively good ridership. After just a year of operation the train was pulled from service in early September, 1985 when North Carolina refused to provide further funding. With this, things changed little for the next years. Then, in 1990 the train was given a second chance when it was relaunched on May 12 of that year as a through service from Charlotte to Washington, D.C. and on to New York. 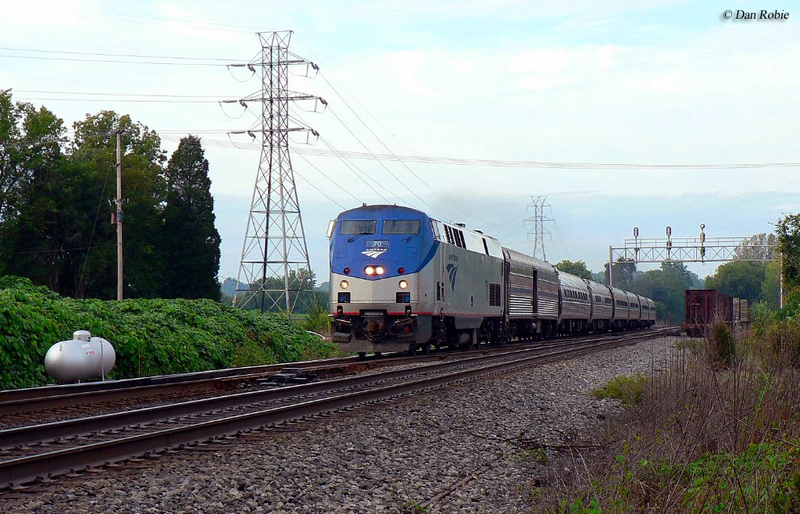 A year later Amtrak dropped the connection to the Palmetto and without the need to offer connecting trains at Richmond the Carolinian not only saw higher ridership but also lower operating costs. Today, the corridor is 704 miles in length and the train is operated daily as #79 and #80 with station stops (from north to south) at New York (Penn Station), Newark, Trenton, Philadelphia (30th Street), Wilmington, Baltimore, Washington, Alexandria, Quantico, Fredericksburg, Richmond, Petersburg, Rocky Mount, Wilson, Selma, Raleigh, Cary, Durham, Burlington, Greensboro, High Point, Salisbury, Kannapolis, and finally Charlotte. While North Carolina does subsidize the train it does not own any of the equipment as is the case with the regional Piedmont Service. Because of this standard Amtrak rolling stock is used on the train which normally consists of a GE P42 and Amfleet cars that include coach and business class as well as cafe service. Finally, the train recently received on board Wi-Fi so travelers can enjoy surfing the Internet while on their trip. A typical journey takes about 13.5 hours to complete, thus the reason that Superliner sleepers are not offered. 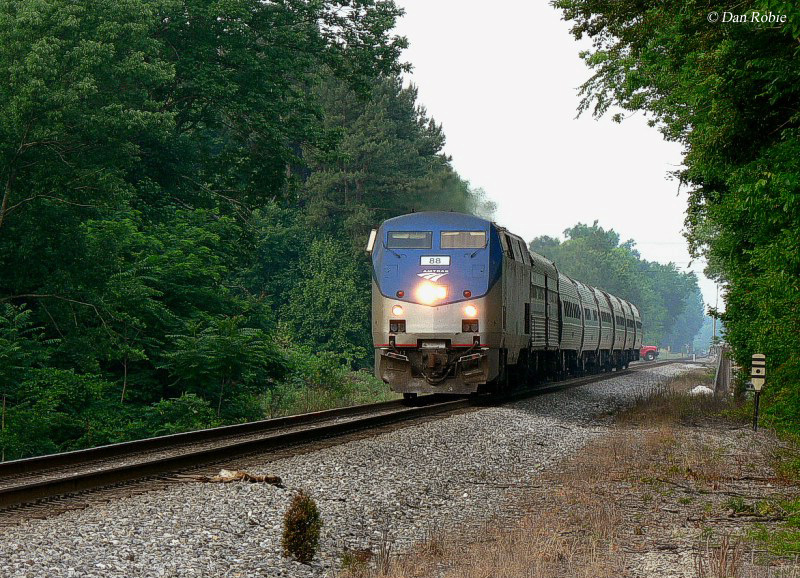 While the Carolinian has not seen such staggering growth in recent years like its counterpart, the Piedmont Service, it has seen steady traffic with more than 300,000 riders in 2011. The route between Charlotte and Raleigh is now owned by the state, known as the North Carolina Railroad (which in total owns 317 miles of track) with rights leased to Norfolk Southern to provide freight service. The Tarheel State has big plans for its future rail service as it hopes to establish high speed operations throughout its borders from Asheville to Wilmington. While the North Carolina Railroad has its owns website which you can visit here, to truly learn about the state’s incredible plans of passenger and commuter rail services you need to visit the North Carolina Department of Transportation’s dedicated website to such called Bytrain.org. This website not only give you the latest scoop concerning ongoing initiatives and plans relating to North Carolina’s railroading operations it also informs about the state’s steps to preserve right-of-ways for future rail use and keeping industries planted in its borders by providing rail access. All in all, the entire site is the best resource on the Internet to learn about North Carolina’s rail industry, from passenger to freight usage.